Fear of a robot takeover has been the driving force of many dystopian sci-fi classic, so how about film where the robot actually just wants to be a good parent? Of course, a robot's idea of raising a child is a little bit different, and comes with a heavy price to pay. 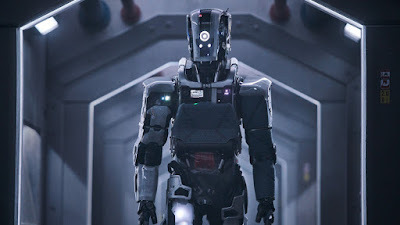 I Am Mother introduces us to one of the most unique cinematic androids in recent memory, the protagonist (?) of a taught, intelligent thriller spliced from the Alien/Aliens gene. The appropriately-named Mother may be a creature of metal parts, gears, and wires, but it's easy to be cooed into comfort by the soothing voice of Rose Byrne. On the day humanity is rendered extinct by some outside calamity, Mother awakens and sets off to work birthing the first/last of humankind. The embryo she selects grows within hours into a girl simply known as Daughter (Clara Rugaard), who is in every way taught to excel. But there's a real kinship between Mother and Daughter, genuine affection that builds as they do arts and crafts, study, and learn together. But Daughter is also curious about the outside world, and soon she's testing just how much she can get away with. In one sequence, the ship is shut down by an unexpected straggler, a mouse that has chewed through the wires. Upon capturing the rodent and setting the ship, and Mother, back online, Daughter inquires about the possibility the outside world is safe, having been told it's too toxic for human survival. Instead, Mother incinerates the stowaway and seems irked at Daughter's curiosity, not to mention her questioning of the stated facts. Has Daughter ever known Mother to lie? Or to be wrong? It isn't long before curiosity begins to look a lot like teenage rebellion. The claustrophobic experience and chilly metallic production design of Alien catches you in its grip, the tension dialed up in degrees by director Grant Sputore. 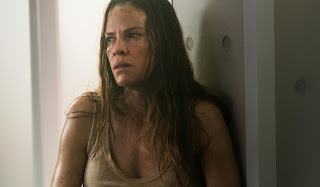 When the outside world finally finds its way into Mother's prison-like bunker, in the form of a mysterious stranger (Hilary Swank), it sets up a tug of war for Daughter's trust. The stranger comes with information that throws Daughter's entire life into question, and the film kicks into a higher gear that Sputore and screenwriter Michael Lloyd Green can't sustain for the long haul. There's great mileage from the dubious trustworthiness of Mother and the stranger, giving the film a swift kick just as it was starting to drag. Mother doesn't trust her, but the woman has considerable reason to be wary of the robot. She arrives with a gunshot wound that needs treating, so she has to trust somebody, and Daughter is all too willing to help. But when Mother perceives a threat, she comes clanking down the steely halls like a metal action hero, ready to show her maternal instincts are real. But what is she really racing to protect? I Am Mother isn't content to simply be what we have been trained to expect it to be. Byrne's calming voice clashes with Mother's intimidating visage, while Swank gives off all the welcoming vibes as a rabid pitbull. Swank's role is ultimately less than it appears to be (and that's a conscious storyline choice, so it makes sense) and probably what we expect it to be. But if you're looking for an Ellen Ripley-type to emerge it's newcomer Dugaard who fits the bill. Daughter's naivete is only the first layer we're exposed to, revealing smarts and toughness that only serve to complicate the power struggle between all three women...well, two women and a robot? Sputore and Kelly fail to maintain a tight control going into a final act that seems enslaved by genre expectations. Gone are the psychological complexities replaced by spooky strobelights, murder weapons, and a standoff that isn't as compelling as it should've been. 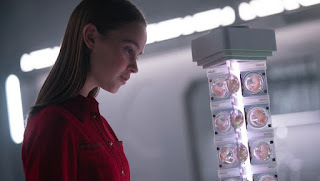 While the last twenty minutes or so don't hold up, I Am Mother's look at the intersection of artificial intelligence and motherhood is thought-provoking and another reason to fear the future of technology.